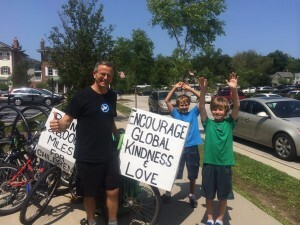 Two brothers from New Jersey stopped in their tracks when the Kindness Bicycle came into view. Everyone should get this excited about kindness! This entry was posted on Wednesday, August 6th, 2014 at 9:04 am	and is filed under Kindness. You can follow any responses to this entry through the RSS 2.0 feed. You can leave a response, or trackback from your own site.